A few gifted people have the insight to observe ordinary events of life&mdash;what people say and do and even what they think&mdash;and discover the extraordinary. Ken Brown is such an observer. His insight into the ordinary and his ability to relate his observations to truth with practical application is significant. Ken's insight into biblical truth is equally noteworthy. For the Christian, it is not enough merely to observe the events and people around them; it is even more important to interpret them in light of eternal truth. From a broad and deep knowledge of Scripture, Ken Brown applies culturally relevant and timeless biblical principles to life and its challenges. 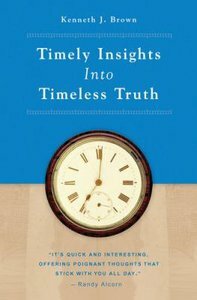 About "Timely Insights Into Timeless Truth"